At last!! The light was bright but not direct sun this afternoon so at last I had the right conditions for a photo shoot, and a working internet connection to share the results - yipee! There are still some small details (including lighting) to complete but this is pretty much how la cuisine and la salle a manger will look when completely finished. Tray - Rosanna Rolla - sorry Rosanna for turning it upside-down and not noticing! 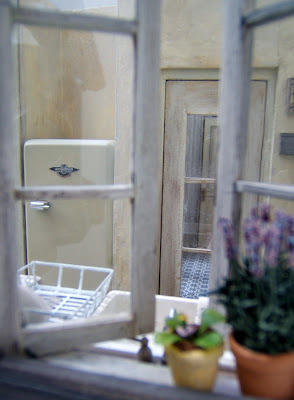 The retro style fridge is by Dolls House Emporium (I think no longer available). It was originally a pale peppermint green, my thanks to my son who spray painted it for me - who would have thought that Warhammer paints would be so useful for a French kitchen!. The badge is an old Frigidaire one found on the internet. 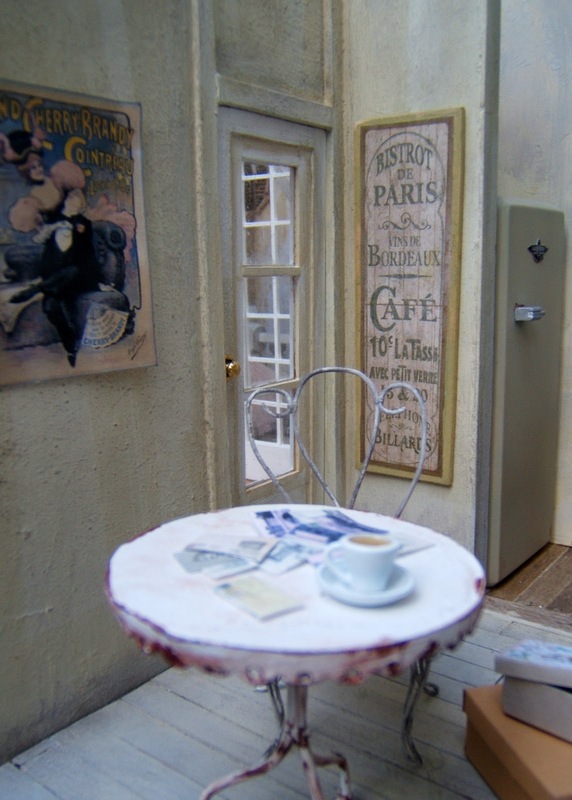 Many thanks to all of the above miniaturists for their special contribution to this project, and to miniature bloggers everywhere for your constant inspiration with special thanks to Lea Frisoni, the Queen of Miniature Shabby French. 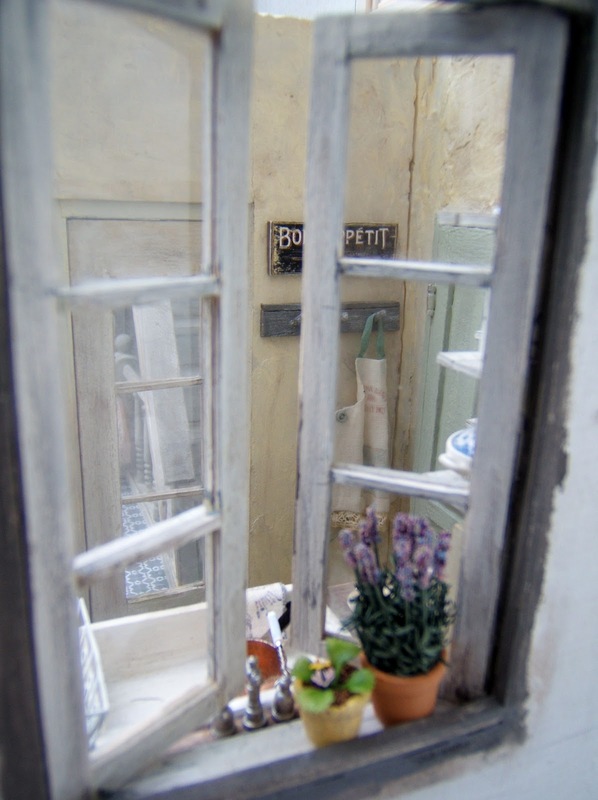 You French Kitchen and Dinning looks so pretty, I just love that shot with the window open, I could hear the french music floating in from the street below.....just gorgeous. un trabajo precioso , me encanta cada detalle que has puesto y si encima hay regalos de amigos , que mas se puede pedir ? Oh Norma, your kitchen is so warm and inviting and wonderful I believe I can smell something appetizing in the oven! Clever lady!!! Beautiful, Norma. Very Parisian and very inviting! This is really beautiful! Love the the photos of your work. It is a beautiful "la cuisine" lovely colors, fine walls, fine door, lovely and beautiful details. Very beautiful and I love looking at your pictures again and again. The dinning place is really nice and cozy and fits so well in style. I love it, it's full of charm. gorgeous! 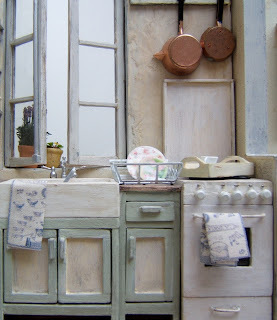 I love it all- the stove is very nice and I really like the pictures on the shutters. What a wonderful collection of minis from so many talented artists! Simply gorgeous! Your photos are superb and capture all the tiny nuances and details. How romantic is your scene; it's so perfect. 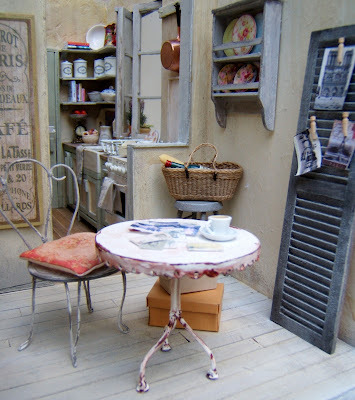 A miniature "dream" . I agree with you that make the collection of objects made ​​by others enrich the project of a miniaturist of a thousand different shades. Love this little kitchen and dining area. 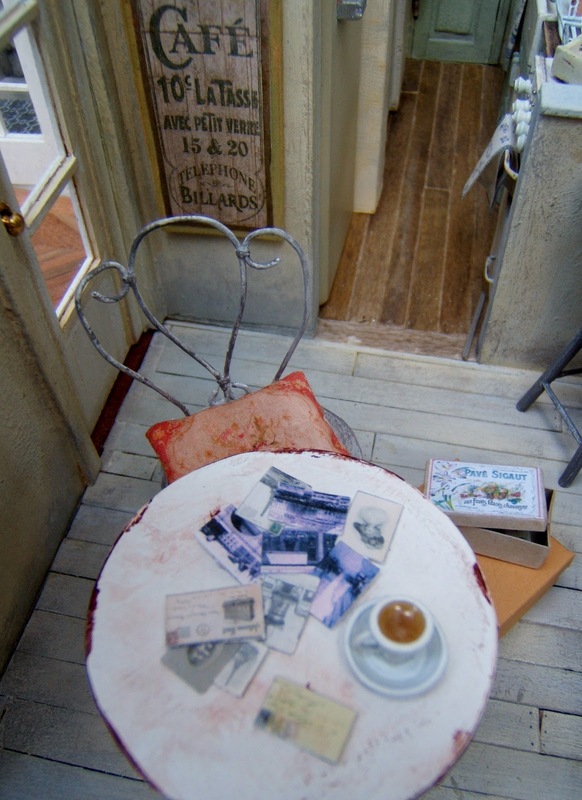 Just want to sit down, enjoy a café au lait and a croissant. Such a cute little kitchen, I like it being so narrow, it makes it so cosy! Norma, it´s gorgeous! I love your style and the colors you chose and it is so interesting to be able to follow the progress of your work! Norma, I really like what you have done so far! This little space has so much personality! The gifts may be diverse but you have managed to put them together so harmoniously that they looked like they were all made by you specially for this. Norma, everything looks so pretty and cosy, I especially like the colors, they are very French! 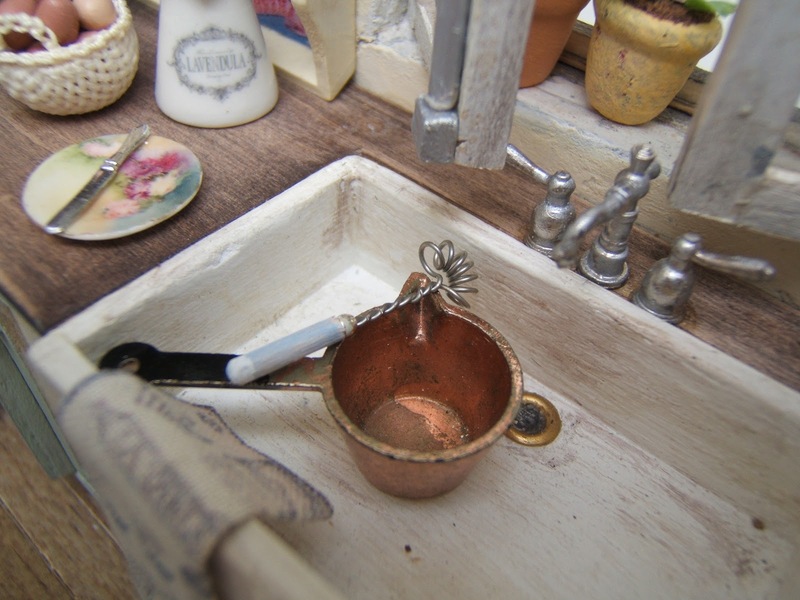 It is great of you to have placed the gifts of other miniaturists in this scene, how thoughtful! A very charming kitchen. I love every little detail and the way you managed to find a place for all the wonderful gifts from your friends. Thanks for sharing. La cocina te ha quedado genial!! Me encanta, no le faltan detallitos!! Hi Norma, Wow I love your rooms, especially the colours in the kitchen, on the doors, and all the little accessories make look so real and very French. Hi Norma! What a charming little space! You have completely captured the essence of a grungy French kitchen and dining area. You have done such a fantastic patina on the cupboards and stove. I also love the sink area and the built in shelves. All the little accessories contribute to the over all relaxed mood of the space. Flower pots on the window and seeing the fridge through the window! You have encouraged me so much by showing all that can be achieved in a small space! I love, love, love it! une ambiance désuète, pleine de charme ! Preciosa cocina!! muy buen trabajo y muy conseguido ese estilo que nos gusta tanto. Me ha encantado!!! Oh, dear Norma, I like when you write in French ( I'm sure to understand … Lol ). Your kitchen and dining has so much charme, lovely colors and I want to visit. You have done a wonderful job. I love the scene in your kitchen! 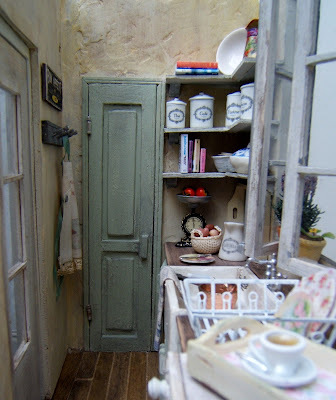 Your little Kitchen is So Unbelievably Charming!!! It is so well put together and beautifully arranged.... it looks so real!!! I LOVE the colors and all the details you have fit into such a small space! It feels like a Kitchen I would Love to spend time in! Norma I love both your work and also your photos it looks a real interior. Wonderful - so real !! Hi Norma! I think that you have a most attractive French kitchen and I am very impressed with the way that you have made a very narrow space seem to be bigger than it is! Good space planning! The blue door at the back of the kitchen. is that a pantry? It is a nice color and the walls are done with such an authentic finish that is very in keeping with the atmosphere of the room. It is all Delightful! Long time no post from me! This latest mini is sweet love it! Im a fair way into scrapbooking now not minis, shame I do love them as much! just a whole lot of work! lovely to see your new minis! I love Mecedes Table would look great in my bakery mmmm! I saw a photo on Pinterest and it linked here. Your work is absolutely amazing! Who wouldn't love this doll house kitchen full size. WOW! Norma its just really beautiful! You have wonderful Mini friends to send such sweet bits and pieces to make it really looked lived in!